Are you hating your New Year’s resolutions already? You should join me and a bunch of other people who simply choose one word to focus on for the year. Instead of resolutions, I choose a single word to guide the year. Who keeps New Year’s resolutions anyway? Not me. But letting one word guide my decisions each day? Now that seems possible! Usually, my word has to do with my walk with the Lord. What spiritual growth would I like to see this year? How would I like my relationship with the Lord to change, to deepen, this year? The little guy in the picture above certainly lived life with utter abandon. 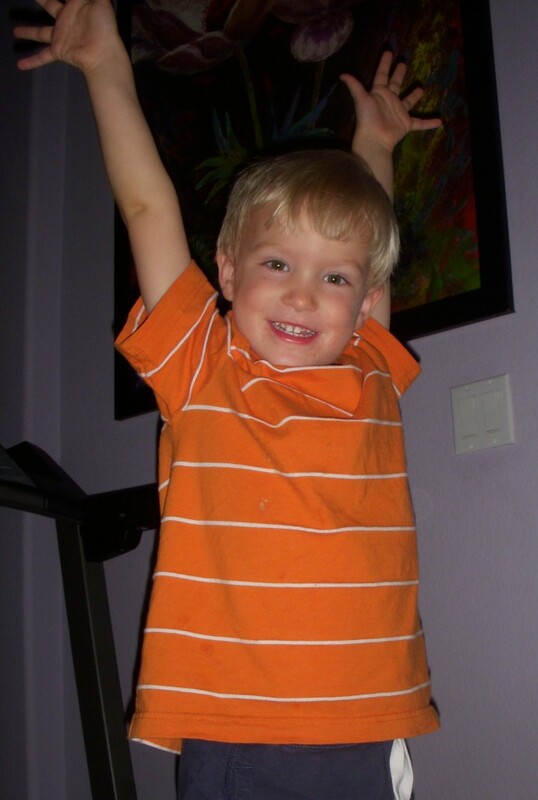 Our three-year-old son, Austin Lee, went to heaven in 2008. Before he left this earth, however, he did everything BIG. Laughter ~ loud. Love ~ fiercely. Action ~ always! Live with abandon by giving everything about me to God. Love with abandon by releasing everyone around me to God. Praise with abandon by singing (even out of tune!) His praise. Write with abandon by creating everything the Lord puts on my heart. Serve with abandon by searching for those in need of God’s love. The list could go on for days. It sounds exciting, but I am also a bit scared. What if I sell out for God and nothing happens? What if I put everything about myself on the line and God doesn’t show up? As long as we live on earth, it is likely these thoughts will creep into our minds. These questions are exactly the ones the enemy used to trick Eve into eating the only fruit God told her not to eat! If I seek God with abandon, with all my heart, He will meet all of my needs. God keeps His promises. He will show up. He will make things happen so that His mighty name can be glorified. Let’s forget those resolutions . . . I’m gonna live with ABANDON! My word for 2018 is dedication. I want to be more dedicated to the things that God has called me to do. I want to be more dedicated to studying the Word. I have a real problem with time management, specifically setting aside time everyday for Bible study and meditation on God’s Word.